Buttermilk Blueberry Muffins – Deliciously Fluffy Muffins Made with Buttermilk, Blueberries and a Crunchy Sugar Topping. I can’t remember exactly when my family’s obsession with blueberry muffins started, but it’s deeply ingrained in our collective family subconscious. Case in point, my stepdaughter named our two cats Blueberry and Muffin. Here they are. That’s Blueberry in the foreground, and pretty princess Muffin in the background. Blueberry’s not supposed to be on top of the kitchen table, but I had to take a picture before shooing him off. Isn’t he gorgeous? Considering the names of our pets, I guess it’s only natural that we love blueberry muffins! 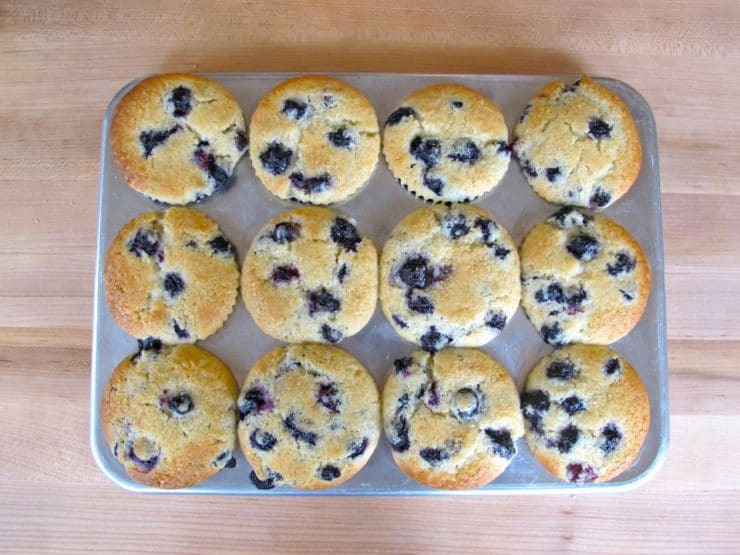 The buttermilk really enhances the flavor of these wonderful muffins, giving them a richness and a slight tang that perfectly suits the sweet blueberries. 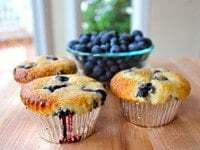 I like to sprinkle the muffins with turbinado sugar on top, so they have a light candy-like shell with a soft and fluffy inside, bursting with berry goodness. 1) If you don’t have buttermilk on hand, you can make your own by mixing 1/2 cup of milk and 1 1/2 tsp of lemon juice or cider vinegar. Mix well, and let the milk stand at room temperature for 5-10 minutes until it begins to curdle slightly. 2) Don’t overmix the muffin batter! These muffins have a wonderful light texture that can become dense if you mix the batter too much. 3) If you want to make these muffins pareve (dairy free), you can substitute almond, rice, or soy milk for the buttermilk… they’ll still be yummy, but I recommend using buttermilk if you can. It adds a delicious flavor. 4) If you only have access to frozen blueberries, go ahead and use them. Keep them frozen and toss them lightly in a little flour before mixing gently into the batter. Frozen berries can be a bit delicate and may break apart a bit in the batter, turning it a bluish color, but the flavor will still be great. Baking time may be slightly longer due to the frozen berries, so check accordingly. These muffins are so tasty. They’re just teeming with luscious, juicy berries. Enjoy! Deliciously Fluffy Muffins Made with Buttermilk, Blueberries and a Crunchy Sugar Topping. Dairy Free Option. NOTE: After receiving feedback from all over the world on this recipe, we discovered that buttermilk in the UK/Europe is somewhat different than buttermilk in the United States (thicker in texture), which can throw off the texture of the batter. In this recipe, the word buttermilk refers to commercial cultured buttermilk, which is only slightly thicker than whole milk. If you don't have this on hand, you can easily make your own by combining 1/2 cup whole milk and 1 1/2 tsp lemon juice. Let it stand for 5-10 minutes, then proceed with recipe. 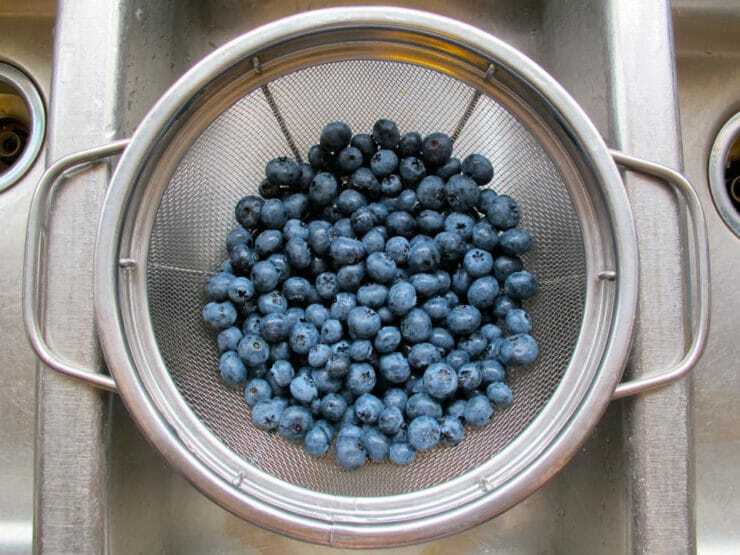 Preheat oven to 400 degrees F. Pick through the blueberries and discard any over-ripe, very soft or mushy berries. Rinse the blueberries in a colander and drain well. Pat dry with a paper towel. Reserve. In a mixing bowl, sift together flour, sugar, baking powder, and salt. 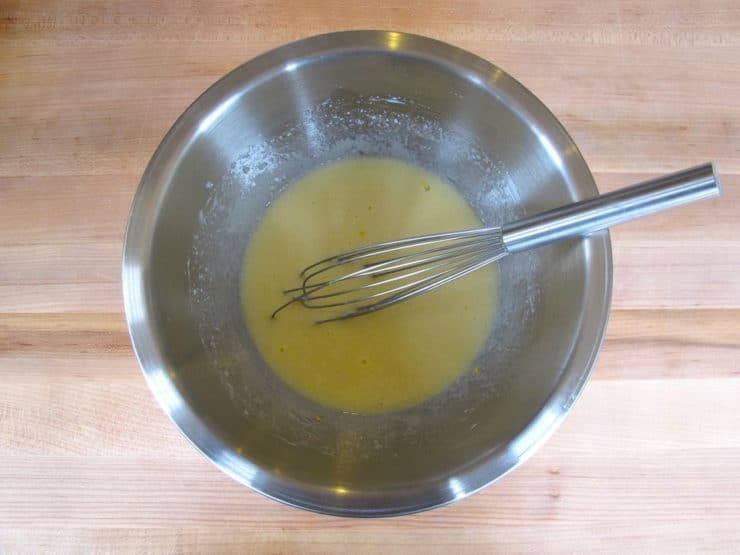 In another mixing bowl, whisk together eggs, buttermilk, vegetable oil and vanilla. Mix wet ingredients into dry using as few stirs as possible; you want slightly lumpy batter, a few streaks of flour are fine. Do not over-mix. 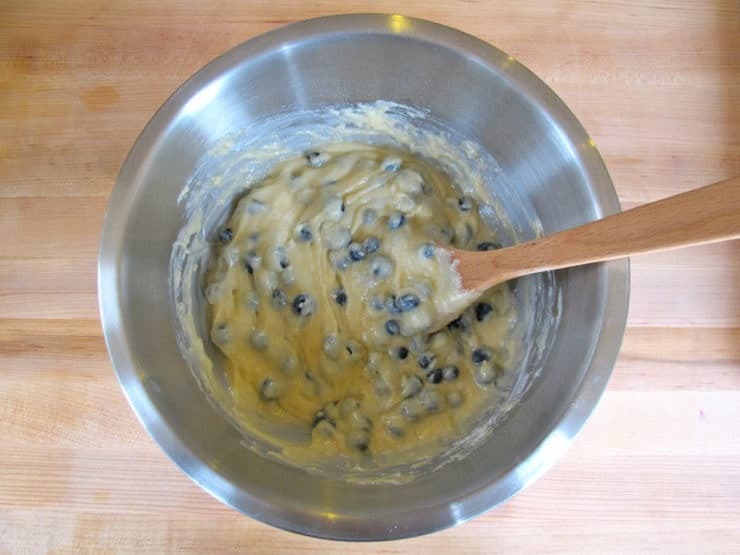 Fold blueberries gently into the batter using as few strokes as possible. Line a standard size muffin tin (12 muffins) with muffin/cupcake liners, or lightly with nonstick cooking spray. 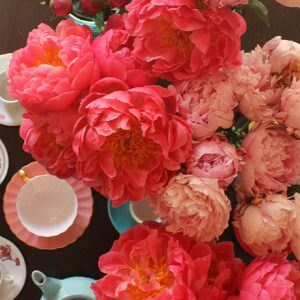 Fill each cup all the way to the top with batter. I find the easiest way to do this is by using an ice cream scoop. One generous scoop of batter will fill each muffin cup. When the pan is filled with batter, sprinkle the top of each muffin lightly with turbinado or coarse sugar. This will add some sweet sparkle and texture to the top of each muffin. Bake muffins for 10 minutes. Turn the muffin tin around (180 degrees) and continue to bake for 5-10 minutes more, or until the muffin tops are golden and springy to the touch. Start testing after 5 minutes, and take them out as soon as they turn springy... don't overcook them, or they'll become dry. Let muffins cool for 15 minutes, then gently remove from the tin. Serve. Note: If you only have access to frozen blueberries, go ahead and use them. Just keep them frozen and toss them lightly in a little flour before mixing gently into the batter. Baking time may be longer, so test for springiness to ensure doneness. Very delicious blueberry muffin. Easy to make and simple ingredients. I love the turbinado sugar on top as it adds sweetness and a crunch. I am rating 5, though mine I would rate a 4 because I only had 1 cup fresh blueberries. Only change I made otherwise was to add 3 TBSP Chia seeds. 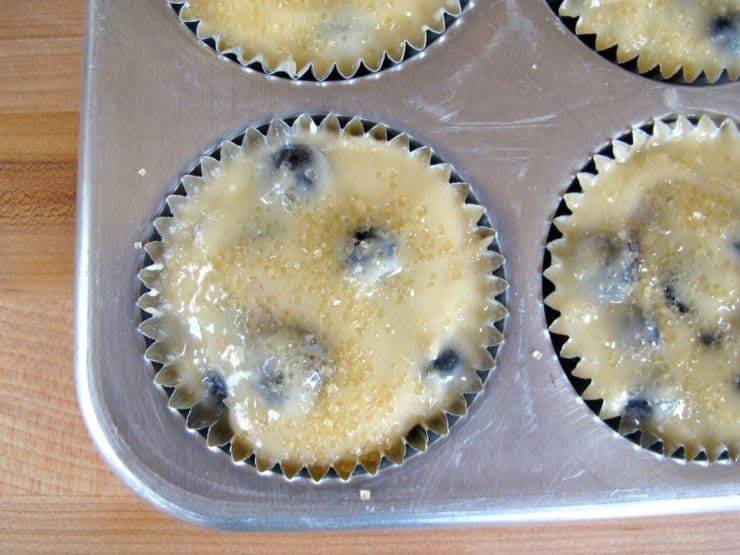 One muffin had lots of blue berries which is needed to give that zest! Do not skimp on blueberries, and the chia seeds gave an added health benefit and texture. Thanks for sharing this recipe! Will make again with ample fresh blueberries! This is a fantastic recipe. I’m using Australian-made buttermilk in Singapore and it worked out beautifully. Very moist and soft. The only caution is that I used less sugar than the recipe called for as I wanted to be “healthy”, but the muffins turned out not sweet enough (duh). I’d follow the sugar requirements to a T next time. Use finally grated apple or finely diced apple instead of half the sugar. Same with banana. Very easy to follow — used lite milk (98% fat) and lemon juice, a high fibre flour, with frozen berries dusted in flour as recommended. Batter was on the thick side compared to picture but end result was fantastic. Thanks for sharing. Hi… IM up high ,altitude wise 3500 feet, and recipe worked fine…but was dry when mixing ,like others comments,added more oil. all came out perfect. used frozen blueberries ,did have to cook an extra few minute till tops browned. delicious. I am going to try this recipe, now i’m in Ontario so of course our buttermilk is somewhat thick but I know will be fine. I do a lot of baking and I was reading the comment from Cat, I can’t see how it was too much flour at all, than to add more buttermilk would make it real runny I would think. Anyways, will try it and let you know how it went. Thank you. Absolutely fantastic muffins! I followed the recipe exactly and I used European buttermilk (thick, but runny enough to pour) I bake a lot and have several trusted muffin recipes. This one is by far the best to use with berries! I made a batch with fresh red currants and a batch with frozen blueberries. To prevent the frozen blueberries from bleeding into the batter, I rinsed the frozen berries with cold water, dried them on a paper towel, and then sprinkled them with flour to coat. I folded them in very gently. The result is perfect! Thank you for this recipe! They’re in the oven as I write and the suspense is killing me!! Quick question; do you know if they will freeze well? Hi Rosemary, I’ve never frozen these, but personally I’m not sure I would– I feel that softer baked items tend to lose some flavor in the freezing process. That said, it might work and if you’re accustomed to freezing muffins or cake-like treats then it’s worth a try. So I went ahead and froze them and defrosted a few days later and they tasted delicious. They were still soft and fluffy and received rave reviews from my work colleagues! I’ll definitely be repeating this recipe. Thank you! Okay, I made a batch and a half of these in mini muffin tins and baked them at 400 degrees for 11 minutes. 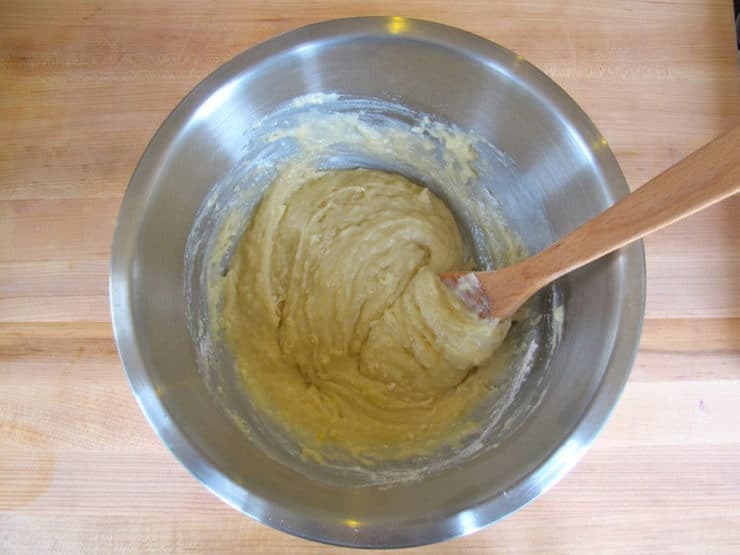 I realized that muffins whose batter had sat on the counter in the bowl the longest had risen and had a nice little rounded top on them rather than the flat top. I’m so happy to know this trick for next time. I made these and they are amazeballs! I added a squeeze of fresh lemon juice and a little bit of zest because I love lemon and blueberry together. They were so good! My batter seemed a little thicker than what is shown in the photos but they turned out fine. I want to make a mini muffin version now and was wondering if I should alter the baking temp or just the baking time. And idea? I was just thinking about adding lemon the next time- wish I had read your post before baking! Like the previous reviewer I found there wasn’t anywhere like enough liquid in the recipe. They are in the oven (at sea level in the UK) as we speak, but I had to add an extra egg, more buttermilk and some normal milk to get them to even a cake like dropping consistency. Perhaps UK buttermilk isn’t as runny as US buttermilk? I used less sugar but the raw mix seemed sweet enough. I would make again but double the liquid and thin it down. My buttermilk was like yoghurt consistency. .
Minky, thank you so much! You have solved an ongoing issue with this recipe that I could not for the life of me figure out. I’ve had so many positive comments on this recipe, but occasionally I get somebody saying the batter is far too thick (not enough liquid). The problem is indeed the buttermilk- in the U.S. buttermilk is only slightly thicker than regular milk, so the difference in consistency is absolutely the issue. I have put a note at the beginning of the recipe. In future, if you decide to try again, please use the whole milk/lemon juice substitution. Thanks again! This is, by far, the best blueberry muffin I have ever made, or tasted. Incredibly delicious! Thank you!! I tried these, waaay too much flour. Had to add in another cup of buttermilk at the end as I was left with a dry biscuit texture. And btw I did follow the instructions and ingredients exactly Still came out tasty though! Cat, are you at altitude? I’m wondering because higher elevations can sometimes effect baking recipes. Other readers have had great success with this recipe, and I’ve made it several times throughout the years with no issues, so I’m not sure what went wrong for you. EDIT – The issue has to do with varying buttermilk consistency outside the U.S. Please read my new note at the beginning of the recipe for folks who live outside of the U.S.
Best muffins EVER! Thanks for the recipe. I am certain it will be used again and again. Excellent! Easy quick and delicious. Made exactly as instructed. Moist without being crumbly. My husband and son absolutely love them. These are amazing, and the pictures are wonderful! I make them for my friends all of the time (and keep a few for me). So glad you’re enjoying the recipe Sarah! I make muffins regularly for my visiting in-laws, and I am always trying new highly-rated recipes. I don’t over=mix, and I measure very precisely (even using a butter knife to level off my flour and sugar ingredients). So, I have no idea what happened here, but this batter was so thick as to literally be difficult to stir at all. I had to add a little buttermilk at the last minute to make it even vaguely stir-able. I was so taken aback by the texture that I quickly consulted other “blueberry buttermilk muffin” recipes online and noticed that the ratio of liquid to flour in this one is significantly off. All other recipes calling for 2 cups of flour also called for at least 1 cup buttermilk. I think this may need to be edited, as many of the 6-star reviews seem to be more for your admittedly adorable cats than the recipe. 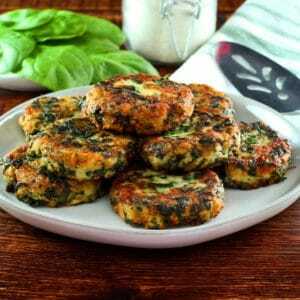 Hi Carr– I’ve held this comment in moderation until I had a chance to re-test the recipe. I was worried based on your comment that something might be off, however I made it again yesterday and it was just as I remembered it– a terrific, tasty muffin with great texture. Sorry you didn’t have a great experience. Hopefully the end result was satisfactory. I just made these, I followed the recipe exactly! They are so easy, so fast, & so delicious. Before finishing this post my boyfriend has devoured 2 of them. I used fresh blueberries. Oh, and I used grapeseed oil. Anyway, amazing recipe! Thank you! Glad you enjoyed them Michelle! I haven’t rued it recipe yet, but just wanted to comment that we had a dog named Muffin and I swore if we ever got a second pet while she was with us, it would be named blueberry, just so that I could call to them, “Blueberry, Muffin….where are you?” Sadly she passed away due to old age last year, but I love the names!! Yes, my stepdaughter Jordan came up with the whole Blueberry Muffin thing… she was naming everything after food at that age! I thought Blueberry was pretty appropriate with those big baby blue eyes. BTW I’m so sorry to hear about your pup. Our little Maltese Momo gave us a health scare recently, he’s 10. We are enjoying every moment we have now that we know he’s not as healthy as he once was. Hi there, I made these last week and we loved them. Do you think chopped strawberries would work as well? Maybe a mix of the two? Thanks! Yes Magilla. The blueberries are naturally sweeter, so I would use a combination of the two. Enjoy! Thanks for writing Natalya! Glad you enjoying the sites and the recipes. I was hoping to make this recipe in a loaf pan to give as gifts for christmas. Any tips about that at all? I added a cup of chocolate chips to the recipe when I made these muffins and they were so yummy!! Hi Meaghan, it should work fine in a loaf pan, but baking time may need to be adjusted slightly (test with a toothpick for doneness) and I’m not sure how many loaf pans this recipe will fill. Glad you enjoyed it! Hi Tory I really want to make these any tips? All the tips are in the recipe Katherine. 🙂 If you have a specific question let me know and I will try to help! The muffins are delish, just made them for my family. I had a few problems though….I used frozen blueberries and that flour trick never works for me. Probably because my batter was very thick and cake-like, so “folding” in blueberries just caused them to crush and turn the muffins blue. Do you think it’s an altitude problem? I live at 3500+ feet above sea level. Because the blueberries were frozen, the baking time was about 22 min. These still tasted very good and I would attempt these again, tweaking it with fresh berries and a little less flour to see how they fare with my altitude and oven. The muffins weren’t dry at all and were the perfect subtle sweetness. Thanks! Hi Shannon! I don’t think it’s an altitude thing… though altitude can definitely vary the cook time and temp, it shouldn’t affect the berries. Frozen berries are simply more delicate than fresh and will break up more in the batter. They won’t look as nice, but they shouldn’t alter the flavor. I definitely suggest using fresh next time if you can. Glad you enjoyed the flavor of the muffins! I made these today with fresh blueberries and they were amazing! The batter is still thicker/cakey than what the photos show, but it didn’t matter. My 4 year old picky eater can’t stop eating them! Very lovely kitties. I can tell that Muffin is a ragdoll. What about Blueberry? (I have a ragdoll myself. What a great breed). Loved the mufffins. They were so easy to make and I had all the ingredients handy. They lasted half a day! So happy you liked them Susie! Hi Marina– you likely overmixed the batter and/or baked them too long. Even baking a few minutes longer than they need can result in tough muffins. Next time, try testing the muffins a few minutes earlier and take them out as soon as they turn springy to the touch. Also, put a baking tin of water on the bottom rack of the oven with the muffins on the rack above– this will help with the dryness issue. When you’re measuring your flour, don’t pack it down tightly into the measuring cup– stir the flour in the bag with a spoon, then use that spoon to scoop it loosely, spoonful by spoonful, into the measuring cup. Level the flour off with a knife. 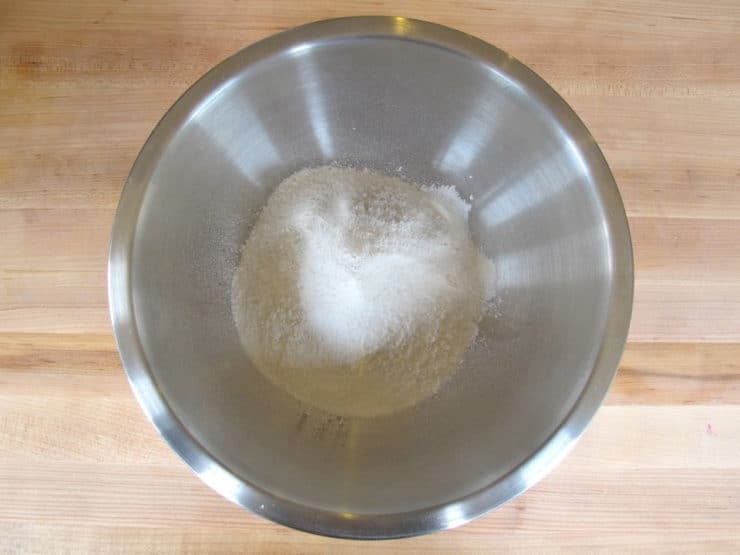 Packing the flour can cause too much flour to be added to the batter, which will result in drier muffins. If you continue to have the same problem, let me know so I can help you troubleshoot. I will surely be trying a cheese fondu soon. And the blueberry muffins as well. Your kitty is beautiful, just like our Tony. is it possible to use dried or feeze-dried blueberries? that’s all I can find. do I need to rehydrate? any suggestions? These look delicious and not real time consuming. Put another tick mark down for someone obsessed with blueberry muffins (and I love the cats names by the way!). There’s just something about a blueberry muffin that’s a bite of perfection every time. Do you know if I can use cranberries instead? I have them in my freezer so I can make these tonight! Hey Gabby, yes! 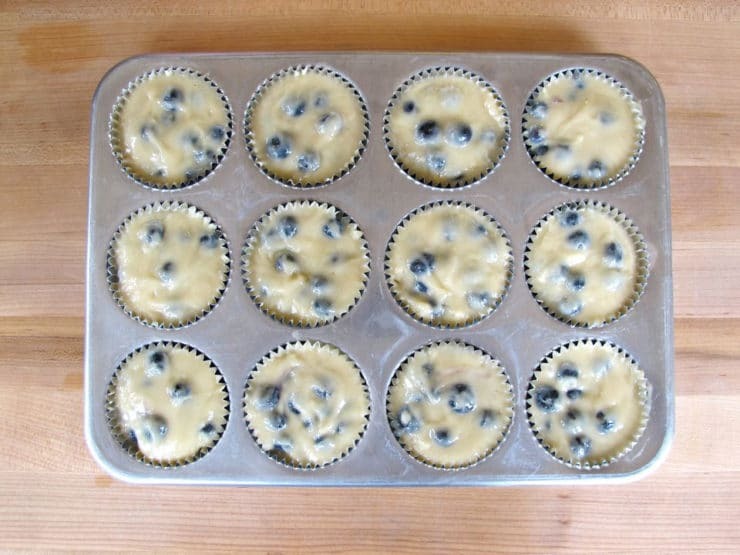 Again, they are much tarter than blueberries, so I would use less berries– 1 1/4 cup or so– and sprinkle the top of the muffins generously with sugar, this will counteract the tartness. Congrats on the Top 9! Completely deserved! Here in the northeast I don’t see blueberries in the markets this time of year. I’ll save this recipe for next spring when they appear in the stores. For now: is there another fruit you’d recommend or do you think those of us on the “other coast” should try frozen ones? Hi Alice! Frozen will work fine, just toss them lightly in flour before you add to the batter. You can also use 1 1/2 cup of chopped strawberries, or try cranberries (use 1 1/4 cup of cranberries and extra sugar on top to counteract tartness). To make a healthier muffin, I used 1/2 of the flour as whole wheat flour and oat bran and walnuts. Of course, I off set that with the buttermilk. I have frozen farm raspberries, will these work? Hi Sam, they should work, but the muffins will be more tart because raspberries have natural tartness. Keep them frozen and toss them in flour before folding them into the batter, and you might want to sprinkle extra turbinado/coarse sugar on top of the muffins to counteract the tartness of the berries. Oh my goodness..those muffins look mouthwatering! Love blueberry in them! Awesome pics too!!! These muffins are perfection, Tori! I love blueberry muffins and I like to eat them warm with some butter!! I agree Stephanie, buttering these muffins when they’re hot out of the oven really makes them sing! Blueberry has amazing color and eyes. From what I could tell, Muffin’s eyes are that fantastic blue as well. Wow. The muffins; gorgeous and delicious looking. I can see the moistness. They could very well be my favorite kind of muffin as well. Cutest cat names ever! I love it! And these muffins look absolutely amazing! Your kitty is so gorgeous! And those muffins look perfect. Love the shots of them in progress. Hi Tori! These are absolutely stunning! 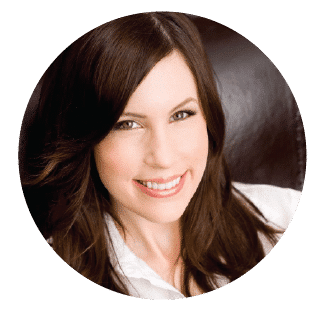 I love blueberry muffins – and the kitties! *sigh* I love kitties! Oh man, these look so yummy. This may be slightly personal, but I’m curious, how does your family fast? Some people don’t eat anything except to drink water and some people fast off certain things meats or sweets. I still haven’t decided how much to fast this Yom Kippur, being in the first trimester with our second. Maybe I will just make a couple batches of these and fast off everything else! I love Blueberries, and I love Buttermilk. Can’t wait to try these! The muffins look delicious! 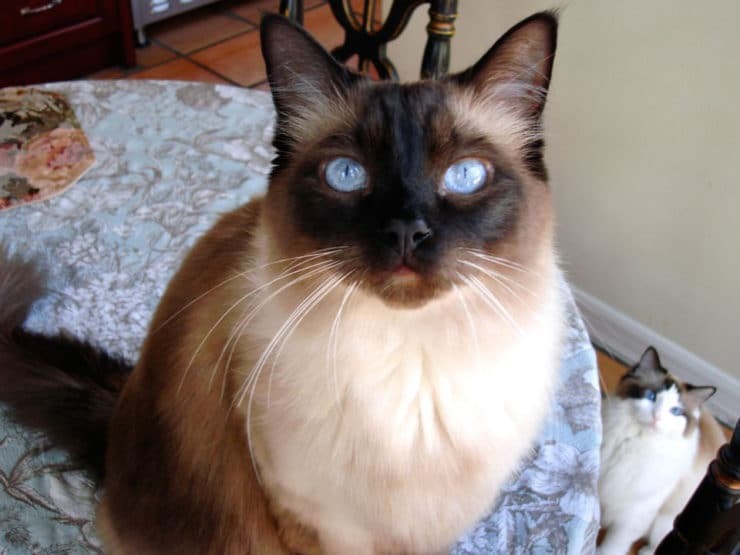 And those cats have the prettiest eyes! Being a huge cat lover I am wondering what breed Muffin and Blueberry are. Muffin looks like a Ragdoll. We have 3 of them. Okay on to the food. These look amazing. I love anything with buttermilk but I rarely have it on hand. It’s hard to find here for some reason. Sometimes they have it, sometimes they don’t. I am a blueberry muffin fan. My fave kind. Hope you are having a great week Tori! Hey Kim! You are right, they are both ragdolls! Best cats ever, so cuddly and floppy. He’s a blue ragdoll, she’s a blue bi-color. I love blueberry muffins and anything baked with buttermilk. YUM. Gorgeous blueberry muffins! 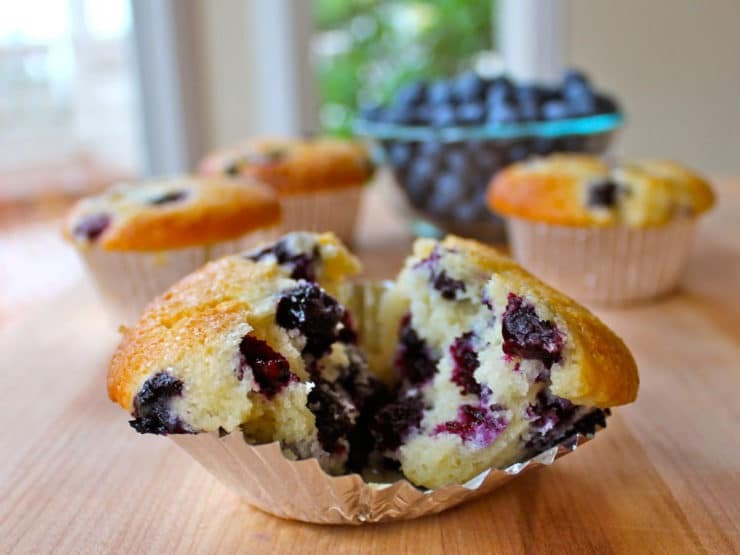 I’m crazy about blueberry muffins…really, anything blueberry. These look perfect for a break fast! Wishing you an easy fast. I needed an idea for something to bring to our break-the-fast. These are perfect! Thank you. May you have an easy fast and a good year! Love blueberry muffins! These seemed so easy too! Usually I am so intimidated with muffins..ha! The cats are lovely and so are the muffins. I have frozen blueberries could I substitute them?